If you are familiar with Alex Flinn's work, you are already aware of the fantastic, whimsical feel of her stories. Like in her debut novel Beastly, with Cloaked, Flinn crafts a charming, magical story that will delight young readers, as well those as who are simply young at heart. The thing you have to remember about Flinn's work is that is it is not meant to be taken completely seriously - it has an airy quality that lends itself to her magical storylines. 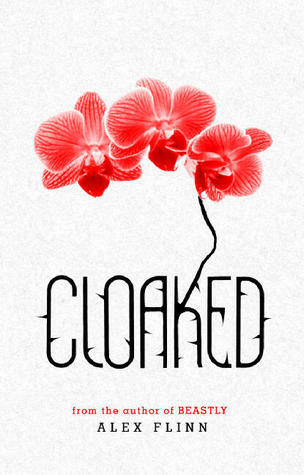 Cloaked is a "modern fairy-tale mash-up" that is about an unlikely hero, Johnny. Johnny is a seventeen-year-old boy who works at his family business, repairing shoes. He is feeling down on himself, because he feels his life is going nowhere, when a beautiful Princess from a foreign land enlists him to help find her "bruzzer" (Princess speak for Brother). Johnny is soon swept up in' a whirlwind adventure that had him traveling to globe and running for his life. You follow Johnny, accompanied by his best friend Meg, as he takes on his dangerous quest. There are talking animals, a magic teleporting cloak, scary bikers, crazy witches and two terrifying giants. Johnny is an interesting character who I found to be incredibly humorous. He could be a bit slow on the uptake though - sometimes I found myself in awe of his cluelessness (I don't know if that's a word, but it is now); especially when it comes to girls. But overall, it is easy to root for Johnny, everyone loves the underdog. I feel like Cloaked was a great read, for the type of book it was meant to be. Like I said before - it's not a serious book; it is meant to be light, entertaining and whimsical. If you look at it under a microscope, I am sure you would find flaws. Often times plot advances aren't exactly logical - but they aren't suppose to be. You aren't suppose to examine it closely, you are simply suppose to reveal in the experience of it. Flinn was trying to emulate the excitement, innocence and magic of a fairytale and I feel like she succeeded. 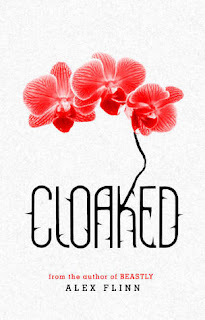 If you go into reading Cloaked with an open mind, I am sure you will find it an enjoyable read. It is a charming and delightful story that can be devoured in a sitting. Thanks for the review of this one - I have it on my wishlist. I read 'A Kiss in Time' recently and loved it. I like modern-takes on classic fairytales. I don't know what to expect of this one. I have both Beastly and A Kiss in Time but haven't read either yet. Which re-telling is Cloaked suppose to be? Is this a good book? I have read both Beastly and A Kiss in Time and I absolutely loved them. this book was great i read it for school and loved it! i reccommend it to anyone that has read Beastly. They are equally great! it kind of drags on and is very long but that is the only bad part. it was great!